You can download my solution to the challenge set in the previous instalment, and all the code samples for this instalment in a single ZIP file here. The challenge set at the end of the previous instalment was to add four static functions to the date and time prototypes we’ve been building up over recent instalments. Because the code for these prototypes is now very long, I’m only including the relevant excerpts below. You can find my full solution in this instalment’s ZIP file (pbs31-challengeSolution.js). We have totally blended the detection of the error with our response, and that’s the problem. The generic error prototype – you can always use this prototype. Many programmers never use any error prototype other than this one. Appropriate when a value is of the expected type, but its value falls outside some acceptable range. E.g. you got a negative number, but you need a positive one. Appropriate when a value is not of the expected type. E.g. you need a boolean but you got a string, or, you need an array and you got a callback. The constructors for all these prototypes expect a string describing the error as the first argument, in other words, they expect an error message as the first argument. To handle your own errors, you need to wrap the code that could generate an error inside a try block, and add your code for dealing with that error inside the matching catch block. This produces and unhandled error. In the parentheses after the keyword catch we define a name for the object representing the error thrown from within the try block. The scope of this name will be the catch block. Think of this like naming the arguments to functions. These are all very contrived examples, to get a better idea of what’s going on, let’s use our date & time prototypes within a web page. Open the file pbs32a.html from this instalment’s ZIP file in a browser (make sure the file pbs.datetime.js exits in the same folder). This page lets you specify a date using three dropdown menus, and then render that date in four different formats. We’ll look at how the dropdowns work in the second half of this instalment, for now, what I want to draw your attention to is what happens when you press the button to render the date. If you press the button with a sane date like the 5th of April 2017, you’ll see the page displays that date in International, European, American, and English formats. It probably won’t surprise you to learn that it does so using our pbs.Date prototype. Now, let’s see what the page does when you ask it to do the impossible – to render the 31st of February 2001. You’ll see that the page responds in a sane way. It doesn’t just write something to the console (where you’ll probably never see it) and then die. The button’s event handler catches the error and uses jQuery to show a human-friendly error message and set the content of each of the output regions to three question marks. For now, please accept that $years.val(), $months.val() & $days.val() return the values selected in the dropdown menus, and focus instead on how errors are dealt with. The handler starts by creating a pbs.Date object using all default values (no arguments passed to the constructor). Then, the handler does all the risky stuff, i.e. dealing with user input, within a try block. Accompanying that try block is the catch block which specifies what to do should the code inside the try block throw an error. The key point is that when we wrote the pbs.Date prototype, we had no idea that it might one day be used on a web page where errors should be written to a <div> with the ID error_out. The code within the prototype simply detects that there is a problem, and throws an error. How that error should be responded to is defined within the page using the API, not within the API itself. In HTML, dropdown menus like those used in the above example are known as selects, and they are defined using the HTML tags <select> & <option>. The dropdown menu itself is described by the <select> tag, and each option within the dropdown by a separate <option> tag. As we discussed in the previous instalment, all HTML form inputs are designed to produce name-value pairs. With dropdowns, the name attribute is set on the <select> tag, and each <option> tag defines the value it represents. Like checkboxes and individual radio buttons, dropdowns should be labeled with a <label> tag, either by wrapping the entire dropdown and the text describing it within a <label> tag, or, by giving the dropdown an ID, and associating a separate <label> tag to the dropdown with the for attribute. What day of the Week would you like Tacos? The user sees the contents of the <option> tags, while the value part of the name-value pair is determined by the value attribute on the selected option. By default, the first option in a dropdown is automatically selected, but you can have any option be the default by adding the attribute selected="selected" to the <option> tag of your choice. Note that the groupings are purely for presentation, the group labels can’t be selected because they are not actually options within the menu. HTML selects don’t have to be rendered as a dropdown menu, they can also be rendered as a scrollable list. You can switch between modes using the size attribute. If the size is 1, you have a dropdown, if the size is greater than 1, you have a scrollable list. The HTML 5 spec does not say sizes between 1 and 4 are not allowed, but some browsers (Safari for example) will never render a scrollable menu with a size smaller than 4, regardless of what value you give the size attribute. If you set it to 1 you get a drop down, if you set it to 2 you get a four-row tall scrollable list, same if you set it to 3, and obviously the same if you set it to 4. For numbers above 4 Safari starts to behave as expected, expanding the scrollable list to the requested size. Finally, selects can allow multiple values be selected at the same time by setting the attribute multiple="multiple" on the <select> tag. Allowing multiple selections results in the select always being rendered as a scrollable list rather than a dropdown. To select multiple elements you have to use the same key combinations you would use to select multiple files in your OS’s file manager, so cmd+click on a Mac. When multiple options are selected, the form data will contain multiple name-value pairs for the select – the name of the select paired with each selected value. Personally, I find scrollable lists ugly and multiple selection difficult for users to figure out, so I avoid using either the size or multiple attributes. If I need users to select multiple values, I prefer to give them a collection of checkboxes click on instead. All examples in this section can be executed in the web console on pbs32b.html from this instalment’s ZIP file (shown above). You can change the name by passing the new name as a second argument. You can get the value of the currently selected option(s) within a <select> element by calling jQuery’s .val() function on the <select> element. Ordinarily, the value will be returned as a string, but if the select allows multiple selections (multiple="multiple", .val() will always return an array, even when no options are selected, or just one option is selected. Note that the value of individual options can be accessed and set by using .val() on a specific option rather than on the select as a whole. Note the use of the attribute selector we learned about in instalment 28, and the use of the second argument to the $() function to limit the search to options within a specific select. Notice that regular selects behave rather like radio buttons – when a given option is selected, the others become un-selected automatically. Multi-selects on the other hand behave more like independent checkboxes – selecting chilli peppers did not deselect any other options. Note the use of jQuery’s $() function with an HTML tag as the first argument to create new HTML elements, the use of jQuery’s .val() and .text() functions to set the value and text of the newly created option elements, and finally the use of jQuery’s .append() function to inject the newly created option elements into the select elements. Also notice that for each dropdown, jQuery’s .prop() function is used to select an appropriate default option. Using the file pbs32a.html from this instalment’s ZIP file as either a starting point, or merely as a relevant example, create a web page that contains five dropdown menus allowing the user to select an hour, minute, day, month, and year, and a button that when pushed renders the selected date and time in ISO8601 format (the format outputted by pbs.DateTime.prototype.toString()), as well as all permutations of American and European date formats and 12 and 24 hour time formats. When the user chooses an impossible date, the page should handle that error in a sane way. 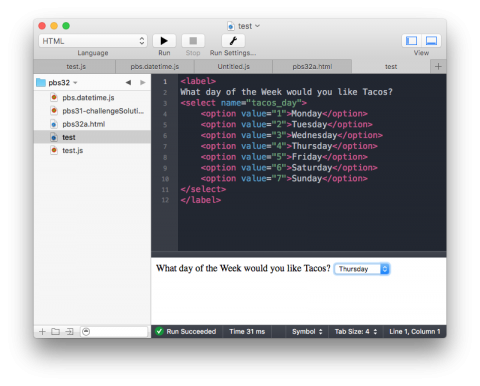 As well as learning about TDD, we’ll also continue to explore HTML forms in the next instalment. I particular, we’ll be focusing on basic text input with text boxes and text areas. As similar as they sound, those two are actually very different beasts in HTML!